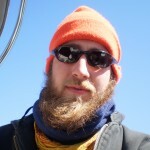 Adam is a modern-day woodsman and resides at the gold-mining town of Jawbone Flats, Ore. When he’s not in the forest he’s frequently at sea. Adam has sailed the seven seas from the Great Lakes to Africa to Alaska. He specializes in inter-species communication, mechanical systems, and improvising with materials at hand–valuable on-board skills gained from a life in the wilderness. In 2009 Adam was an integral crew of Silent Partner’s infamous voyage around Vancouver Island, successfully sailing, tacking, and jibing the ship for 1,200 miles of pure sailing bliss. We’re always thrilled to have Adam on deck for many more voyages.